These two ski goggles are known for their easy lens switching. The Switchlock technology implemented on both of these two models allows you to insert a lens quickly and precisely, and swap it with the same swiftness and precision. They also have comfortable face cushioning. However, Oakley Airbrake XL is quite more expensive than Oakley Airbrake. Why is the dramatic price difference? What are the differences between Oakley Airbrake vs Airbrake XL? Continue reading below to find the answer. 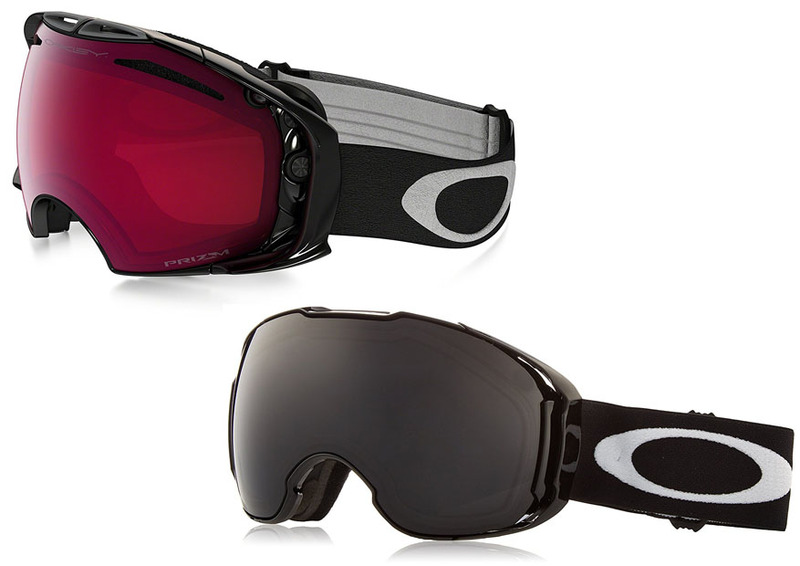 Oakley Airbrake is a very good ski goggle that is known for the superb versatility in various conditions. It is equipped with the Switchlock technology for easy lens switching, and it comes with two lenses plus a protective case right out of the box. One lens is for daylight and the other is for lowlight. The optically correct dual-vented lens features the F3 anti-fog coating. It performs very well. The lens provides excellent clarity, and it does not fog at all even in the coldest winter months. To swap the lens, you only need to release a latch behind the left outrigger. Then, change the lens, and relock the latch. The rigid exoskeleton is equipped with the flexible O Matter faceplate to provide comfort and protection. It has a layer of foam to make it fit comfortably. The faceplate ensures that the goggle will not apply too much pressure on your face. The frame’s outriggers are relatively thicker if you compare them to Oakley Airbrake XL’s. However, they are unobtrusive, and they allow you to wear the goggle with or without a helmet. The weakness of Oakley Airbrake would be the limited peripheral vision. As you can see, this is not exactly a large goggle. Instead, it is more of a compact goggle with a narrow lens. So, it will not provide a very expansive field of view. It simply allows you to see the visual in front of you. Oakley Airbrake XL is actually very similar, as it also comes with the Switchlock technology and the O Matter faceplate. So, you can also swap its lens easily, and it is also quite comfortable to wear for an extended period of time. The dual-pane lens also has the F3 anti-fog coating for uncompromising performance in any weather condition. It includes two lens tints. The primary difference between Oakley Airbrake vs Airbrake XL is the size. Unlike Oakley Airbrake, Oakley Airbrake XL has a larger lens which provides a more expansive field of view. It allows you to have more peripheral vision. You may also notice that the ‘bridge’ of the lens has a more pronounced curve. This is mostly because of the larger size of the lens. The bridge needs to be cut deeper to make enough room for the user’s nose. The difference between Oakley Airbrake and Oakley Airbrake XL is the size. Oakley Airbrake allows you to focus on the visual in front of you, but the peripheral vision is very limited. Because of this reason, we recommend you to choose Oakley Airbrake XL, which has a larger lens to provide a wider field of view.